Japan has deployed its first operational F-34 stealth fighter to the Misawa Air Base. The development comes as China is becoming increasingly bold in the East China Sea and around disputed territory. The F-35 will replace Japan’s ageing F-4s, and will become an essential part of their future air defences. 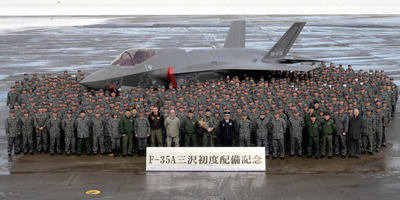 Just before the end of January, the Japanese Air Self Defence Force (JASDF) announced that it had deployed its first operational F-35 at Misawa Air Base. Misawa Air Base is shared by the JASDF and the US Air Force, and located in the northern most part of Japan’s Aomori Prefecture. “The F-35A will bring transformation in air defence power and significantly contribute to the peace for citizens and ensure security,” JASDF 3rd Air Wing commander major general Kenichi Samejima said. The F-35 will be the most advanced fighter jet in the JASDF arsenal. Nine more F-35s are planned to be deployed by the end of the 2018 fiscal year. In all, Japan intends to field at least 42 F-35s over the next few years. The first four F-35s were made in the US, and the remaining 38 will be assembled by Mitsubishi Heavy Industries in Japan. Despite some controversies like cost overruns and the issue that no Japanese-made parts will be in the future jets, the F-35 is seen as essential for the JASDF in countering an increasingly capable and aggressive China. Japan has reportedly been mulling replacing the helicopters on their Izumo-class helicopter carrier with the short vertical take-off and landing (SVTOL) variant of the F-35 that is fielded by the US Marine Corps, something that China has warned against.